Set among various museums in London, like the Science Museum, the Victoria and Albert, the Natural History Museum and the Royal College of Music is the Imperial College of London. 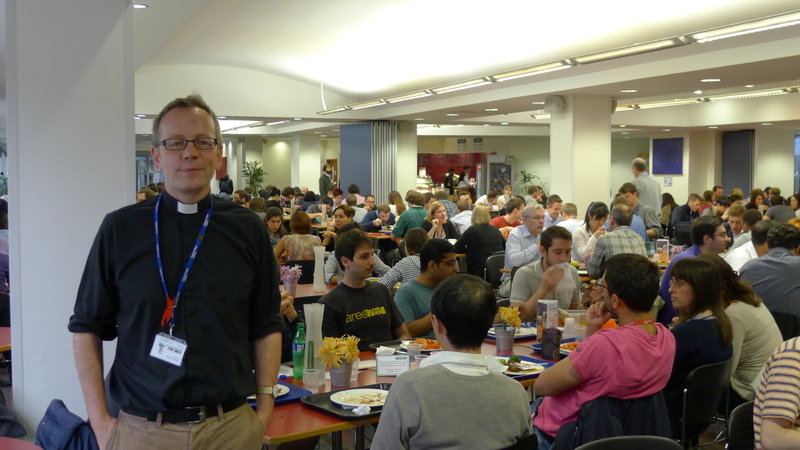 There I met the chaplain, Andrew Wilson for lunch today. We joined the throng in the staff and postgraduate cafeteria. Nearly 50% of these students come from overseas, undertaking research in applied sciences and technical applications to mathematics, in fields such as engineering and aerospace. But on the way to meet Andrew, I noticed an art exhibition in the huge glassed-in foyer – artistic responses to fields of mathematical and applied mathematical theory. I remembered Erica Jolly’s book “Challenging the Divide” which is a plea for inter-disciplinary engagement between the arts and the sciences. I picked up a copy of the catalogue for the exhibition to give to her when I return home. Andrew and I have been connecting at university chaplaincy conferences for a few years now. It is wondrous that on different sides of the globe we find ourselves on such similar paths, exploring chaplaincy practice informed by the theme of hospitality and responding positively to the number of international students of various faiths, supporting them at this special time in their lives. Andrew is yet another chaplain who is venturing into this seemingly new domain, common the the MoTiv chaplains, and also the domain of the Nokia project manager. Put simply, it seems to involve a sensitivity to know when one is a guest and when one is a host – and how to be a good guest and a good host. We had a great time of sharing and affirmation. No doubt we will keep in touch and swap notes when we meet again. This entry was posted in Uncategorized on July 3, 2013 by Geoff Boyce.